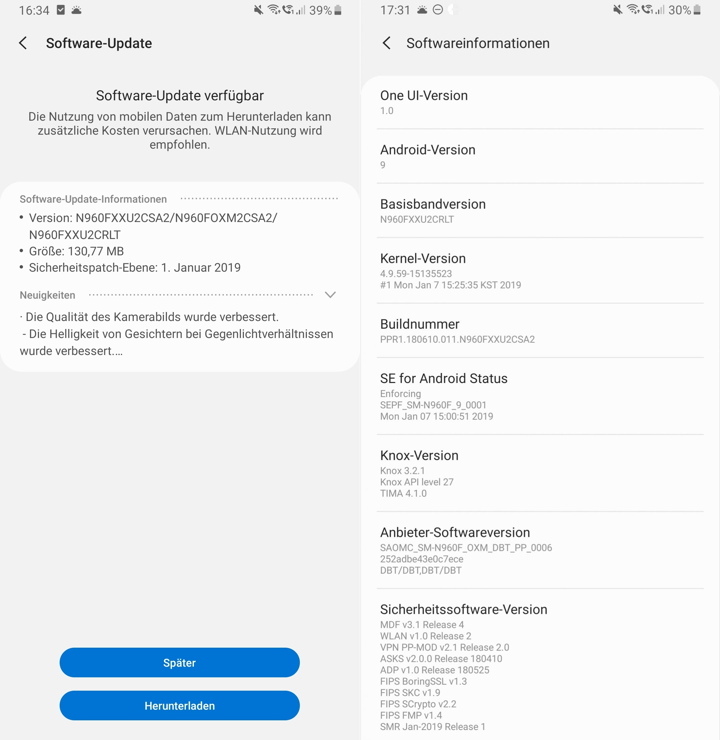 Samsung has started rolling out second official stable Android 9.0 Pie OTA update for the Galaxy Note 9 SM-N950F with build CSA2. However, the update rollout is in a phased manner. So only specific countries of Europe are currently receiving the latest OTA notification; more specifically in Germany. Here we have listed the OTA update zip from the previous One UI Beta as well as from the Android Oreo firmware so you won’t lose any data. We have also listed the full stock firmware N960FXXU2CSA2 for the Galaxy Note 9 SM-N960F so you can fresh install it using latest Odin tool. The stable One UI for the Exynos Note 9 rolled out with build CRLT. Today, we are receiving yet another update featuring January 2019 security patch. This is the second OTA with firmware build number N960FXXU2CSA2 and comes with some One UI optimizations and bug fixes. It has the same Baseband version as before and comes in a small package. Here we have listed the update zip file for Exynos Note 9 Android 9 Pie official stable. To update, your device need to be running on either the Oreo or ARK2 stock firmware or the One UI beta ZRLT. Here is the full stock firmware for the Note 9 with build number N960FXXU2CSA2. This can be used to flash directly via Odin flash tool. Here is a tutorial on flashing full stock firmware via Odin. The full firmware update we have listed above has been tested working with many Exynos variants that belong to the CSC build OXM. How to Update Exynos Note 9 to stable One UI based on Android 9.0 Pie N960FXXU2CSA2? Before you update your Note 9 to Android 9 Pie, make sure your device is a Exynos variant. Also, before you flash the above OTA updates or stock firmware, make sure that your device has OXM in the CSC build. In order to check, open up the dialer and type in in *#1234#, and check if OXM is in the CSC section. If it does, then you are good to proceed. If you want the OTA update to Android 9.0 Pie, then download the update zip from above and install it using stock recovery or ADB sidelaod method. Head over to our previous tutorial on how to install OTA update zip from here. Moreover, if you want to flash the full stock firmware, then see the above section or here – how to flash from here.